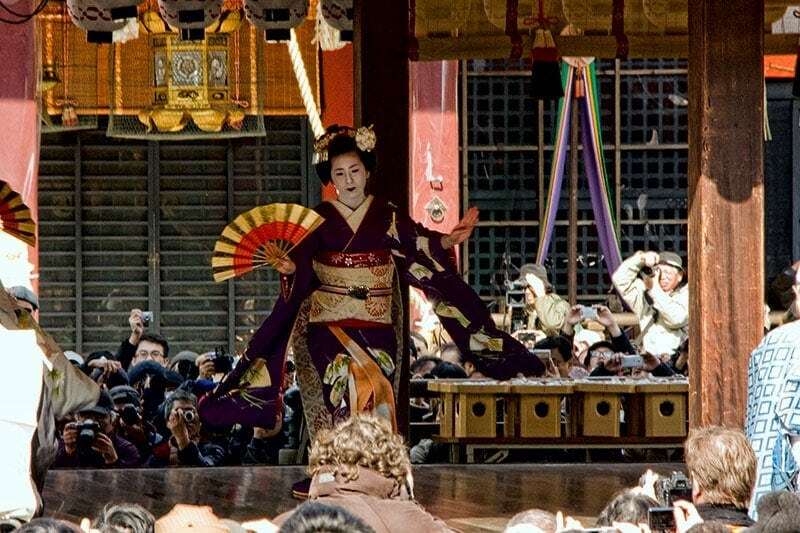 If you’re visiting this historic city a Kyoto geisha experience might be one of the things you’d love to do. For most foreign visitors an intimate evening with a geisha, or geiko and maiko as they are called in Kyoto is unlikely but we have seen them surprisingly often in the city and there are ways to improve the odds. We do love the spring dance and have written before about our experience at the Miyako Odori and tea ceremony held at the theatre. 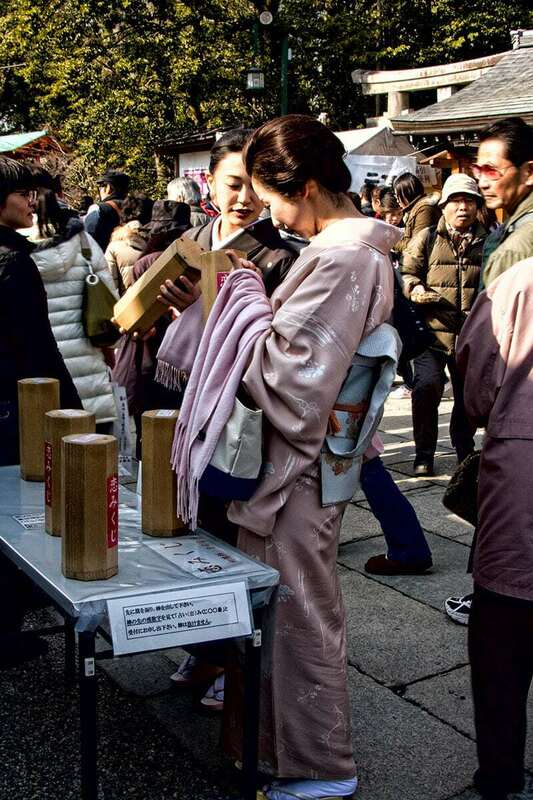 We’ve also seen them in the streets of Gion and other parts of Kyoto but this article is about seeing them as a local might, at an annual festival celebrating the coming spring. It’s not your average day in the peaceful surrounds of Yasaka Shrine but it does happen every year and it’s a fantastic day to be in Kyoto. 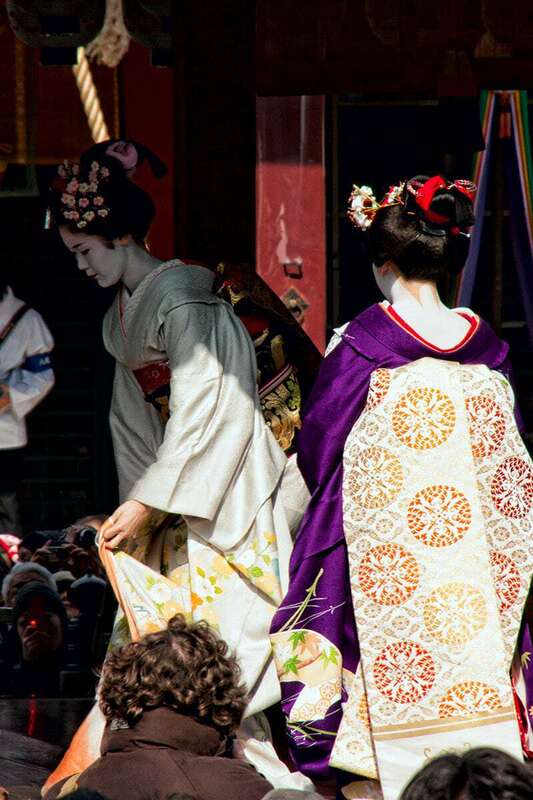 When else can you have a traditional Kyoto geisha experience for free or see people happy to be hit in the head with soybeans thrown by a Shinto Priest for that matter. On the 2nd February at Yasaka Shrine, the main shrine in Gion, it is the eve of Setsubun, and a very special celebration is getting underway. It’s the start of Setsubun-sai. These crowds, made up predominantly of locals, are assembled to celebrate the lunar spring under the old calendar. With the move to the Gregorian calendar in 1873 Setsubun is now celebrated earlier when winter is still making its chilly presence felt. Although it’s a popular event, Setsubun isn’t a national holiday so when the date falls during the week the celebrations will not be quite so crowded as they would be on a weekend. Shinto priests known as Kannushi and Shrine maidens called Miko are dressed in ceremonial outfits as the procession moves onto the stage. The eyes of the crowd follow them then quickly flick back in the direction they came from as two immaculately dressed Maiko (apprentice Gesiha) of the Ponto-cho region move gracefully towards the stage. They seem peaceful and unaware of the crowds and commotion around them. They are about to perform a dance rarely seen by average Japanese people, let alone foreigners like us. The shamisen, a 3 stringed traditional Japanese instrument begins to play and a hush falls over the gathered crowd. Geisha perform mostly at intimate private parties, frequented by the most wealthy and well connected businessmen. 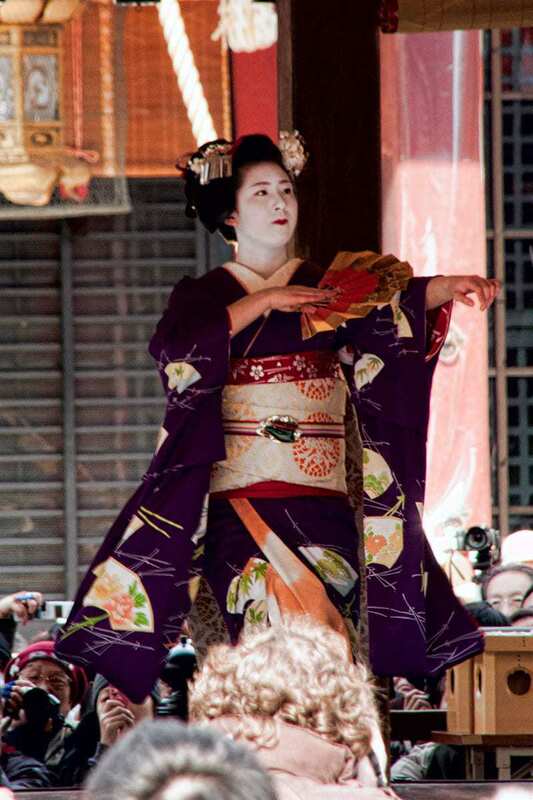 There are few opportunities throughout the year for people to witness a geisha performance in a public setting. The spring dance at the Gion Kobu Kaburenjo Theatre is one option which takes place in the month of April. 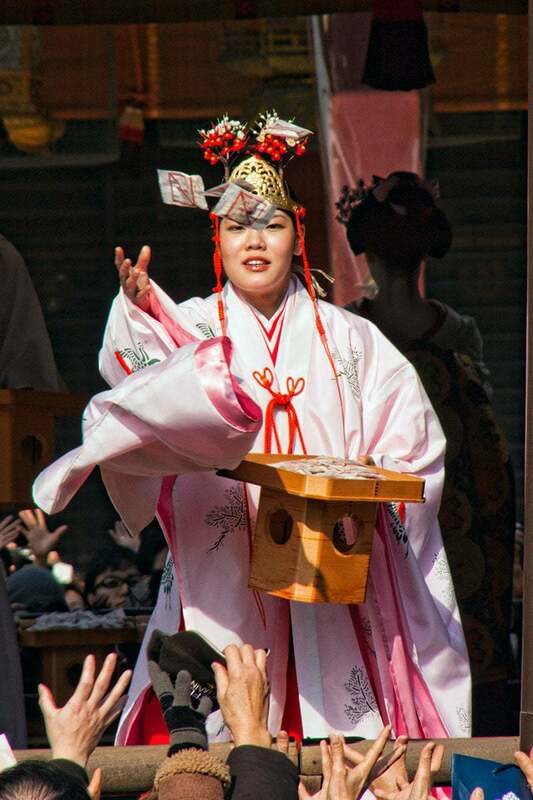 Then on the 25th February at Baika-sai, geisha of the Kamishichiken district perform a tea ceremony amongst the plum blossom at Kitano Tenmangu Shrine. Some visitors will attend the demonstrations at Gion Corner or hotel organised dinner functions where they will have the opportunity to see a geisha but we’ve chosen to avoid these. We much prefer to catch a quick glimpse as they head out to their evening functions or at one of the infrequent but long established community events like Setsubun-sai. Our attention, everyones’ attention, is then locked on the stage as the two Maiko perform their slow and deliberate dance routine. Its beautiful to watch and I can only imagine how many hours of training and practice have gone into memorising and perfecting each tiny movement. It truly is magical. It soon becomes clear that we have picked our slightly elevated position at the back rather than the front of the stage. Not that it matters too much as shrine stages are open on all 4 sides and we have a reasonable view. The Geisha dance choreography is designed to address the VIP guests though so the better views are from the side of the shrine buildings. If you ever need to tell the difference the steps are at the back of the stage, having said that we have used this to our advantage at other times getting excellent views of the participants entering and exiting the stage at both weddings and another ceremonies. 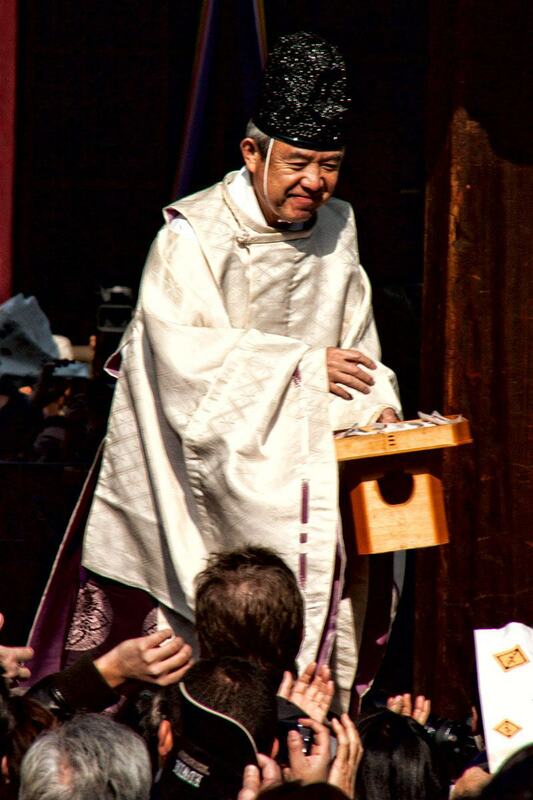 After the performance priests, shrine attendants and Maiko take up wooden containers holding little packets of fortune beans (fuku mame), they contain dried soybeans which the crowds wait eagerly and enthusiastically to catch. In typical Japanese fashion it’s a fairly gentle battle to catch a packet, no one of course would shove anyone else but there were definitely a few Grandmas elbows finding their mark as they made their way to the front and enthusiastically escaped with their loot. If you’re not lucky enough to catch, or be caught as one man was, with the lucky beans you can purchase them within the Shrine grounds. They taste OK but for a legume snack I’d much prefer wasabi peas or spiced chickpeas. The reason they are sought after though isn’t so much about taste but that they are lucky to consume during Setsubun, it’s customary to eat one for each year of your age plus one for good blessings in the year to come. 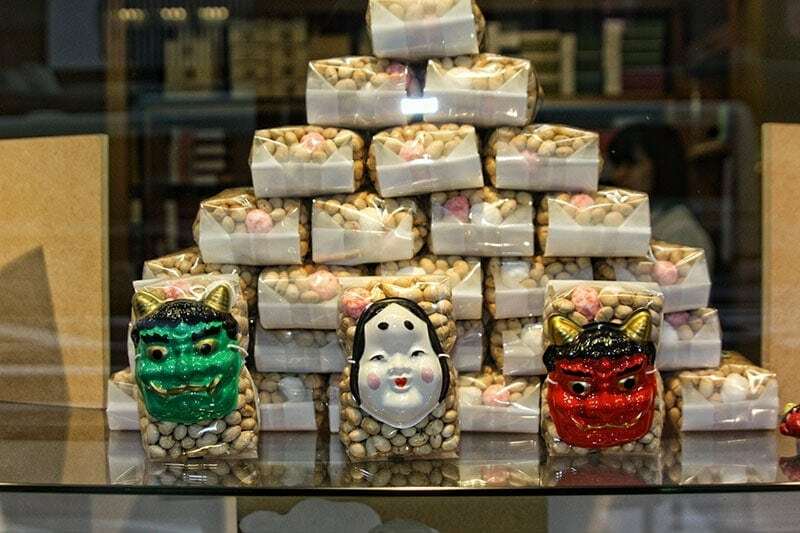 You can also buy them locally in the traditional sweet shops of the Gion area in these cute little packages adorned with ogre masks. As the crowd starts to disperse there are a few other activities taking place around the Shrine grounds. The first is people getting their fortunes by shaking little sticks from containers and retrieving the fortune of the same number. The good thing about shrine fortunes is that if you get a bad one you simply tie it to the appointed tree or frame and it doesn’t follow you home. Another activity was what appears to be a local form of festival lottery. Making our way towards the tents on the far side we handed over the ticket that came with our lucky beans and were corralled in the direction of a queue forming in front of one of the tents. We traded our first ticket and drew a second slip of paper which had something we couldn’t read written on it. This was then taken to another row of tents to collect your prize. Everyone gets something, no major prize for us though, like most people we received a snack or drink. All a bit of fun. Finally there’s ame-sake service taking place which is a sweet sake offered to visitors. We didn’t participate at Yasaka as we had a few other spots in mind to visit in the later part of the afternoon but we did try it at Gangoji in Nara the next day. As usual when you find yourself in a predominantly local event everyone was super friendly and you’re made to really feel part of the celebration. 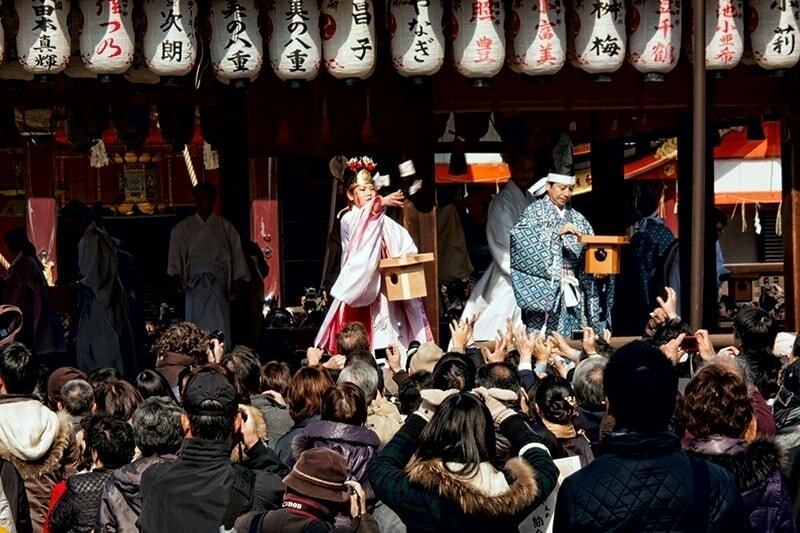 Interested to know more about the Setsubun traditions and festivities? You’ll find more in this article where I reflect on the 10 things I love about Setsubun. We always try to build a few festivals, events and celebrations into our visit to Japan as it’s a chance to see something quite different and explore the culture and traditions a bit more deeply. Setsubun could be described as a fun twist on the western routine of spring cleaning, as winter comes to an end and we all want to approach the new season with a fresh home and positive outlook. I particularly like that the Japanese tradition has managed to combine that with the consumption of delicious giant sushi rolls! If you’ve participated in Setsubun-sai celebrations around Japan please let us know in the comments how they differ in other regions, temples or shrines. Sounds like such an interesting experience- if I enjoyed reading about it so much I can only imagine how great it would be to see this in person. Thanks Natasha. 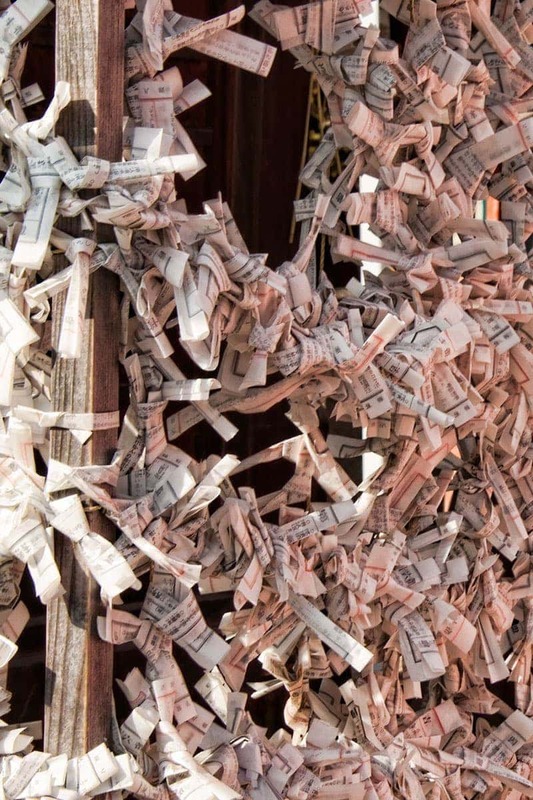 We love anything to do with Japanese culture and history so we’d highly recommend this shrines Setsubun activities. Such an interesting account of Setsubun. I love how you start it out. So funny! Your photos that went along with this story were absolutely amazing. I’ve only been to Kyoto in the summer and winter so never for this festival. I was in Tokyo during this time and don’t really remember it, so thanks for teaching me something new about Japan! WOW, that was quite a show you saw. I wonder if you even tried on one of those beautiful kimonos? I know they can be rented to walk around town. I would surely not miss the opportunity! Quite an interesting headline. However, after reading your post I do understand. I have had sake a couple of times, which I really enjoyed. I have seen a Geisha performance in the movie Memoirs of Geisha and I found it was really amazing. They are really skilled and I assume a lot of practice is needed. I really enjoyed your account of the celebrations. I’ve always seen geisha dresses on tv and pictures but it must be a real treat to see them in person. Looks like a beautiful celebration. The serene look on the one geisha’s face is stunning. Enjoyed your post–I would love to be able to tie some of my bad fortunes to a tree or frame! wow, that sounds like an amazing and such an unique event! I’ve never heard of it before but I’m hoping to make it to Japan in 2016 so hopefully I will be able to experience something similar! What a fascinating insight, thanks for sharing. I hope you managed to get a fortune bean! That is all so cool! 2nd of February is my birthday so perhaps i have a new activity…and so you know to wish me happy birthday Toni! 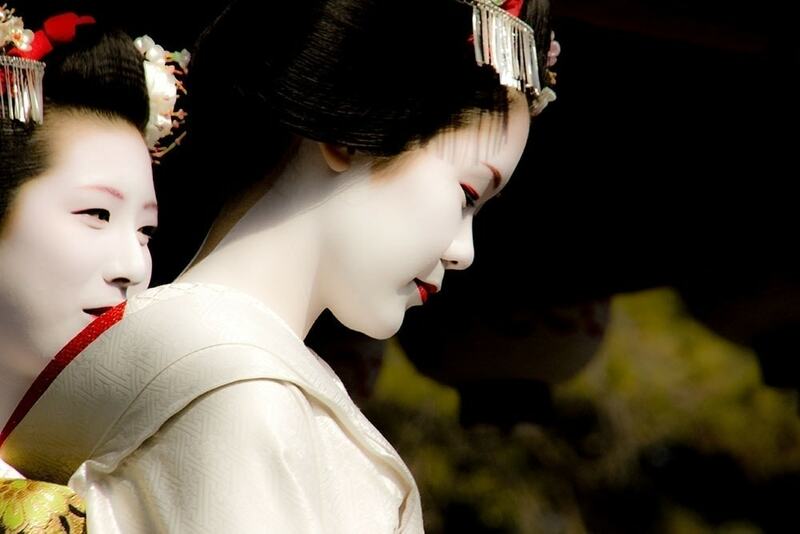 Great post and must get to Japan to see these porcelain skin beauties! What an unique experience, thanks for sharing it with your readers. I love the first photo. It looks like from some movie. Wow, what an amazing experience! Japan seems like a culturally fascinating country. must get there! what a fabulous experience. And your first photo looks like a china doll. I haven’t been to Japan – and every time I read your features I wish I had plans to do so! Didn’t know you would ever be able to see something like this in a public setting. Would be pretty neat to see as I’ve always found geisha fascinating! What a great opportunity to experience a celebration with the locals! Beautiful pictures. Thanks for sharing!